This B&H Kit includes three Auray M-LED3-CL 3-LED clip-on gooseneck lights, each offering broad, consistent illumination for musicians, producers, and engineers in homes, studios, and a variety of live stage applications. The flexible 8.5" gooseneck allows versatile positioning for optimal angling and orientation. An integrated spring-loaded clip enables fast and secure attachment to surfaces such as music stands, desktops, and shelves. Adjust the brightness via the two-step control, for illumination levels appropriate to the amount of ambient light. Being long-lasting, cool-running, and efficient, the LEDs are designed to keep your gear visible for years to come. Each M-LED3-CL can be powered via three supplied AAA batteries or connection to USB or AC power. Lightweight and compact, each one can fit conveniently in a storage pocket, bag, or case. The Auray M-LED3-CL is a 3-LED, clip-on gooseneck light offering broad, consistent illumination for musicians, producers, and engineers in homes, studios, and a variety of live stage applications. The flexible 8.5" gooseneck allows versatile positioning for optimal angling and orientation. An integrated spring-loaded clip enables fast and secure attachment to surfaces such as music stands, desktops, and shelves. Adjust the brightness via the two-step control for illumination levels appropriate to the amount of ambient light. Being long-lasting, cool-running, and efficient, the LEDs are designed to keep your gear visible for years to come. The M-LED3-CL can be powered via three supplied AAA batteries or connection to USB or AC power. Lightweight and compact, it fits conveniently in a storage pocket, bag, or case. Light up your instrument, pedalboard, music, or computer with low-heat LEDs. 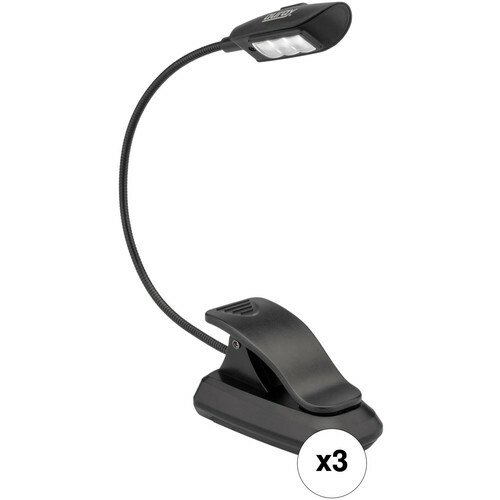 The 3-LED lamp is attached to an 8.5" gooseneck, which can be easily positioned for optimized illumination. The M-LED3-CL features a spring-loaded clip for quick, stable attachment to a music stand, piano, tabletop, or shelf. Weighing only 2.4 ounces, it is convenient to store and transport. The two-step brightness control allows ideal lighting to suit your surroundings. Opt for a low glow or switch to a bright beam, whatever suits your workstation. Insert the three supplied AAA batteries in the M-LED3-CL, then operate it in any location. Consistent brightness is maintained thanks to the low power draw of the LEDs. For extended periods of use, connect the M-LED3-CL to a powered USB port or AC adapter (USB cable and AC adapter available separately). The LEDs boast device-friendly efficiency, effectively avoiding power overdraw. By emitting minimal heat even throughout extended periods of use, the LEDs can be placed close to equipment without compromising safety. Box Dimensions (LxWxH) 7.8 x 5.0 x 1.9"